They’re what the PADI Advanced Open Water Diver course is all about. And no, you don’t have to be “Advanced” to take it. It’s designed so you can go straight into it after the PADI Open Water Diver Course. The PADI Advanced Open Water Diver course helps you increase your confidence and build your scuba skills so you can become more comfortable in the water. This is a great way to get more dives under your belt while continuing to learn under the supervision of your PADI instructor. To achieve the PADI Advanced Open Water Diver rating, you need to do 5 Adventure Dives, out of which 2 (Underwater Navigation & Deep Dive) are compulsory. You may choose the other 3 adventure dives based on your interest. The most common choices are: Peak Performance Buoyancy Dive, Search & Recovery Dive, Fish Identification DIve, Wreck Dive, and Night Dive. The topics that will be covered include: Thinking like a diver, and practical aspects and physiological aspects of deep diving. More ways to use your underwater compass and how to navigate using kick-cycles, visual landmarks and time. How to better use your dive computer and/or electronic Recreational Dive Planner Multilevel (eRDPML) and much much more, depending on the Adventure Dives you choose. The knowledge development portion of the PADI Advanced Open Water Diver Course consists only of multiple choice knowledge reviews of the 5 topics covered. There is no final exam. 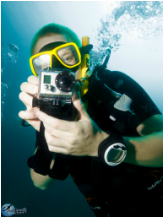 Do the knowledge development portion of the PADI Advanced Open Water Diver Course online now. A typical schedule of the Advanced Open Water Course at Anti Gravity Divers. Once you are an Advanced Diver, a common next step is the PADI Rescue Diver Course. As an Advanced Diver you will get to experience sites that were beyond your reach previously. 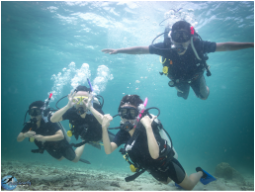 You can also take PADI Speciality Courses and further your knowledge in individual areas such as Deep Diving or Underwater Photography. We conduct the PADI Advanced Open Water Course at 5 dive sites around both of Perhentian Islands. Depending on your choice of Adventure Dives you might visit one of the wrecks or some of the deeper sites that were previously out of your reach.